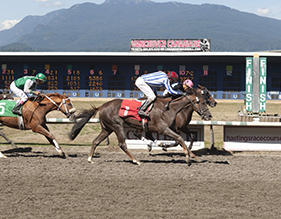 Square Dancer, bred by Brent and Crystal Fernung and sold by their Journeyman Bloodstock, captured the $100,000 Redekop Classic Handicap at Hastings Racecourse Aug. 3. The 5-year-old chestnut gelding rallied smartly while rallying four wide around the far turn of the 1 1/8-mile test, getting up in the final strides to win by a nose over pacesetter and race favorite Modern. Ridden by Scott Williams, Square Dancer stopped the clock in 1:50.15 in winning the first stakes race of his career. Now a winner in eight of 25 outings, Square Dancer is owned by a group of 200 racing enthusiasts who campaign the Florida-bred under the banner of Hastings Racing Club, which is managed by Richard Yates. The Sunshine State product, who is trained by Steve Henson, has amassed a bankroll of $178,645. Trainer Kathleen O’Connell bought the son of Circular Quay—Dance Special, by Theatrical (IRE) from Journeyman Bloodstock for $25,000 out of the 2012 OBS June sale of 2-year-olds in training. The Fernungs currently have a yearling and foal by the late Wildcat Heir out of Dance Special, who is in foal to Journeyman Stud stallion J P’s Gusto for 2016.